The English Toy Spaniel is a compact, cobby and essentially square toy dog possessed of a short-nosed, domed head, a merry and affectionate demeanor and a silky, flowing coat. His compact, sturdy body and charming temperament, together with his rounded head, lustrous dark eye, and well cushioned face, proclaim him a dog of distinction and character. The important characteristics of the breed are exemplified by the head. Size - The most desirable weight of an adult is eight to fourteen pounds. General symmetry and substance are more important than the actual weight; however, all other things being equal, the smaller sized dog is to be preferred. Proportion - Compact and essentially square in shape, built on cobby lines. Substance - Sturdy of frame, solidly constructed. Head large in comparison to size, with a plush, chubby look, albeit with a degree of refinement which prevents it from being coarse. Expression - Soft and appealing, indicating an intelligent nature. Eyes - Large and very dark brown or black, set squarely on line with the nose, with little or no white showing. The eye rims should be black. Ears - Very long and set low and close to the head, fringed with heavy feathering. Skull - High and well domed; from the side, curves as far out over the eyes as possible. Stop - Deep and well-defined. Muzzle - Very short, with the nose well laid back and with well developed cushioning under the eyes. Jaw - Square, broad, and deep, and well turned up, with lips properly meeting to give a finished appearance. Nose - Large and jet black in color, with large, wide open nostrils. Bite - Slightly undershot; teeth not to show. A wry mouth should be penalized; a hanging tongue is extremely objectionable. Neck - Moderate in length; nicely arched. Topline - Level. Body - Short, compact, square and deep, on cobby lines, with a broad back. Sturdy of frame, with good rib and deep brisket. The tail is docked to two to four inches in length and carried at or just slightly above the level of the back. The set of the tail is at the back's level. Many are born with a shorter or screw tail which is acceptable. The feather on the tail should be silky and from three to four inches in length, constituting a marked "flag" of a square shape. The tail and its carriage is an index of the breed's attitude and character. Shoulders well laid back; legs well boned and strong, dropping straight down from the elbow; strong in pastern. Feet, front and rear, are neat and compact; fused toes are often seen and are acceptable. Rear legs are well muscled and nicely angulated to indicate strength, and parallel of hock. Profusely coated, heavy fringing on the ears, body, and on the chest, and with flowing feathering on both the front and hind legs, and feathering on the feet. The coat is straight or only slightly wavy, with a silken, glossy texture. Although the Blenheim and the Ruby rarely gain the length of coat and ears of the Prince Charles and King Charles, good coats and long ear fringes are a desired and prized attribute. Over-trimming of the body, feet or tail fringings should be penalized. The Blenheim (red and white) consists of a pearly white ground with deep red or chestnut markings evenly distributed in large patches. The ears and the cheeks are red, with a blaze of white extending from the nose up the forehead and ending between the ears in a crescentic curve. It is preferable that there be red markings around both eyes. The Blenheim often carries a thumb mark or "Blenheim Spot" placed on the top and the center of the skull. The Prince Charles (tricolor) consists of a pearly white ground, with evenly distributed black patches, solid black ears and black face markings. It is preferable that there be black markings around both eyes. The tan markings are of a rich color, and on the face, over the eyes, in the lining of the ears, and under the tail. 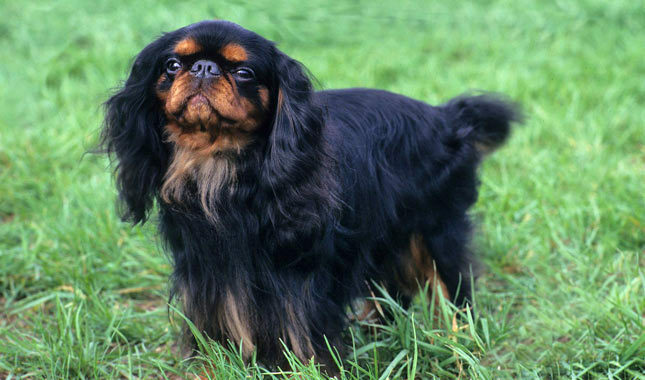 The King Charles (black and tan) is a rich, glossy black with bright mahogany tan markings appearing on the cheeks, lining of the ears, over the eyes, on the legs and underneath the tail. The presence of a small white chest patch about the size of a quarter, or a few white hairs on the chest of a King Charles Spaniel are not to be penalized; other white markings are an extremely serious fault. The Ruby is a self-colored, rich mahogany red. The presence of a small white chest patch about the size of a quarter, or a few white hairs on the chest of a Ruby Spaniel are not to be penalized. Other white markings are an extremely serious fault. Elegant with good reach in the front, and sound, driving rear action. The gait as a whole is free and lively, evidencing stable character and correct construction. In profile, the movement exhibits a good length of stride, and viewed from front and rear it is straight and true, resulting from straight-boned fronts and properly made and muscled hindquarters. The English Toy Spaniel is a bright and interested little dog, affectionate and willing to please. Click Here to Learn about breeder background checks on English Toy Spaniel breeders if you are looking for English Toy Spaniel puppies for sale. Click Here to learn how ResearchBreeder.com can help you find healthy English Toy Spaniel puppies for sale. Click Here to order a Breeder or Kennel Background Check on English Toy Spaniel Breeders that may have English Toy Spaniel puppies for sale. Click here to find the national breed club for English Toy Spaniel puppies for sale. Click Here to purchase a list of approved ResearchBreeder.com English Toy Spaniel Breeders who have English Toy Spaniel puppies for sale.